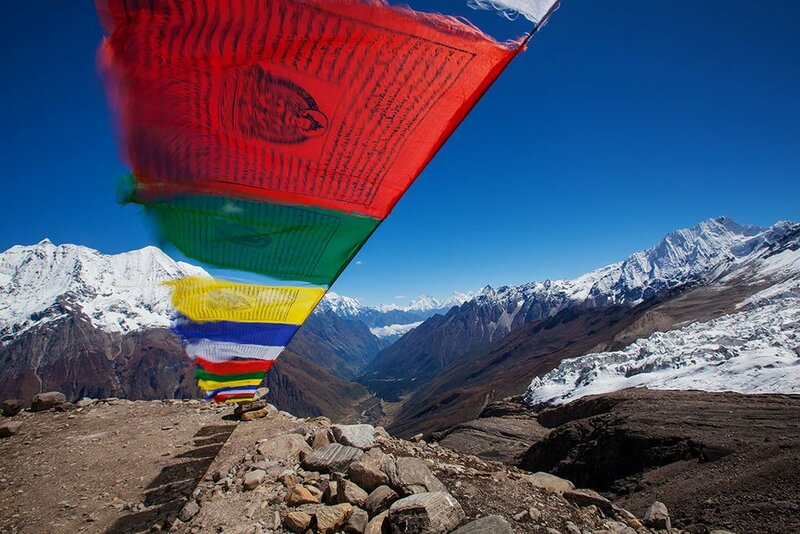 Why trek the Manaslu Circuit Trek? Experts consider the Manaslu Circuit Trek among the best treks in Nepal. 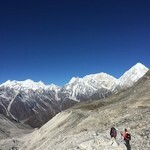 Despite its recent rise in popularity, the Manaslu Trek remains remote and off-the-beaten-path compared to the better-known teahouse treks in Nepal. 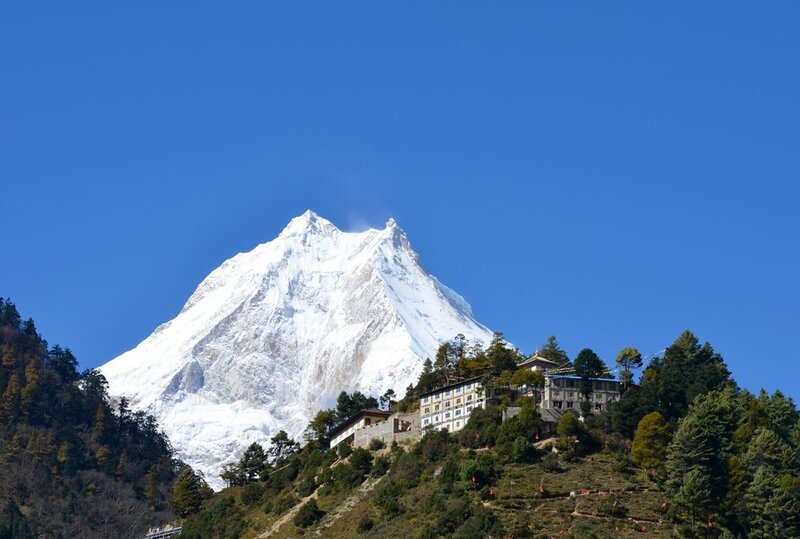 The trek takes you around Manaslu, the world's eighth highest mountain at 8,163 meters (26,781 ft). The trek is wild and remote, yet there are teahouses at everyday stage, so trekkers don’t need to bring tents and food, making it more accessible and affordable than similar treks. The trailhead is reached over land, avoiding the need for domestic flights. 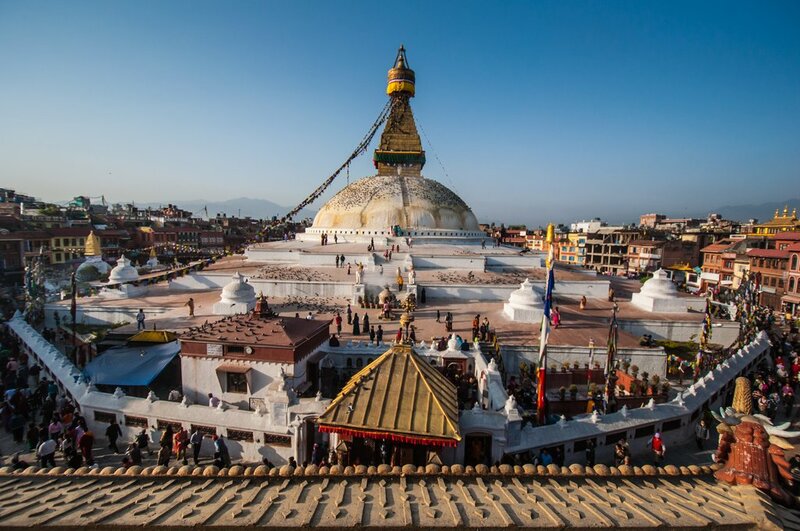 The scenery provides all Nepal has to offer: you'll trek from the subtropical jungle at lower elevations, through the Himalayan foothills to the high, cold and challenging crossing of the Larkya La above 5,100 meters / 17,000 feet. 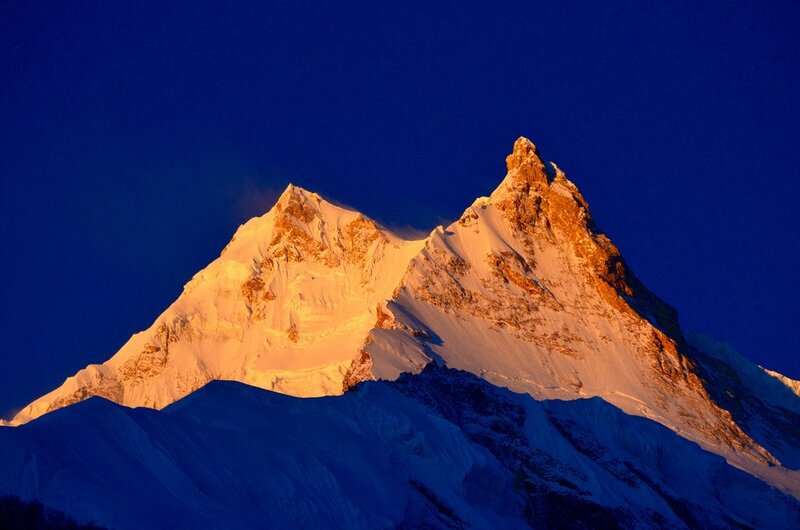 Ready to start planning your Manaslu Circuit Trek? 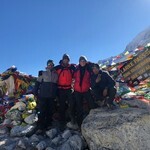 We work with the very best local specialists in Nepal who are ready to help organize your trek. For a private trek get started here. To join a small group tour check out pricing and availability here. 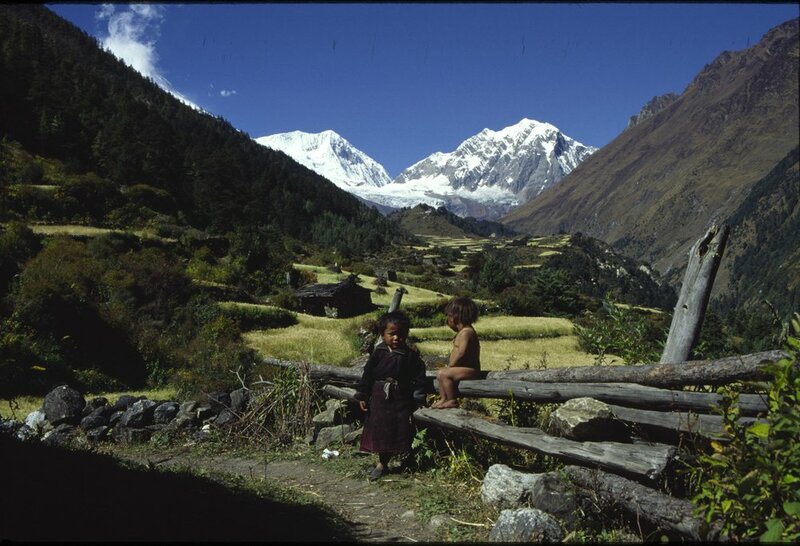 The trailhead of the Manaslu Circuit trek is the closest to Kathmandu of the major Nepalese treks. That said, it's still an adventurous 126 km (80 miles) drive from Kathmandu to Soti Khola, which takes about 6 hours by jeep (recommended) or 8+ hours by public bus. If road conditions are challenging (which is often the case at the tail end of the monsoon in September) you may have to start walking in Arughat, which adds an extra day. 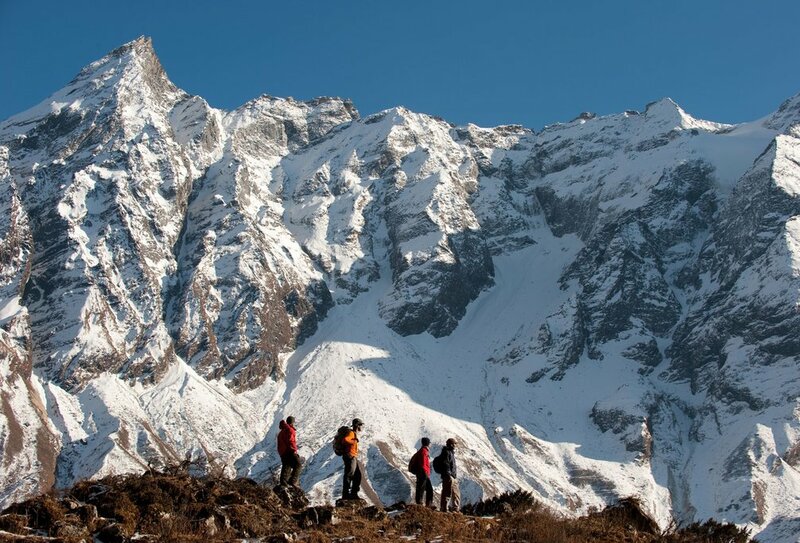 The Manaslu trek is within a restricted region of Nepal, meaning you'll need a trekking permit to access this route. Solo trekkers are also not allowed, where a minimum group size of two people is required. 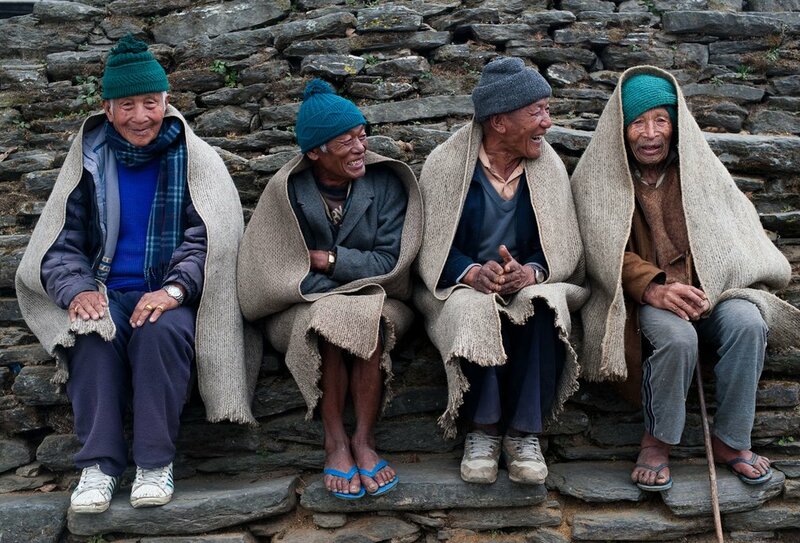 Each night, you'll be staying in local teahouses run by the local communities along the trek. Most teahouses are quite basic but comfortable, with two single beds in each room. There is a common area for meals and relaxing, which is a great place to stay warm around the fire at night. To see what teahouses look like, check out our article on Teahouse Trekking in Nepal. After breakfast, you'll drive west along the Kathmandu-Pokhara Highway towards the village of Soti Khola, turning off toward the hilltop village of Dhading. The drive passes through rural communities, small towns, green terraces, and lush hillsides. 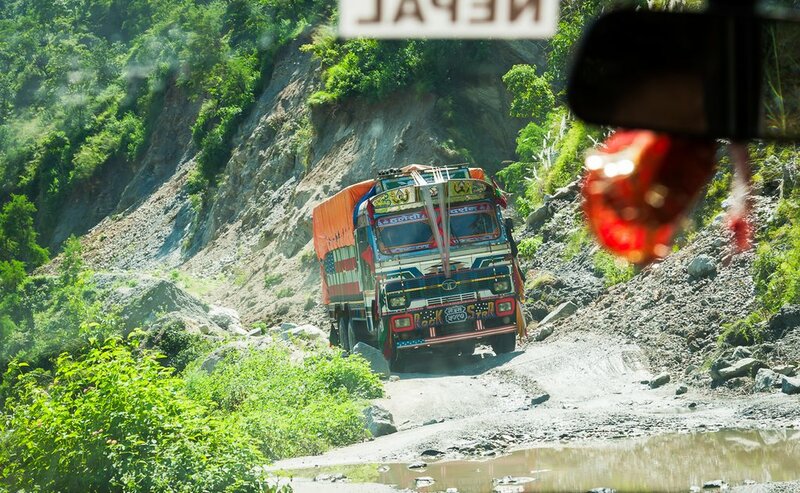 The road will eventually become a rutted, dirt path and you'll start to see views of the southern slopes of Annapurna, Manaslu, Ganesh Himal, and Langtang Himal. 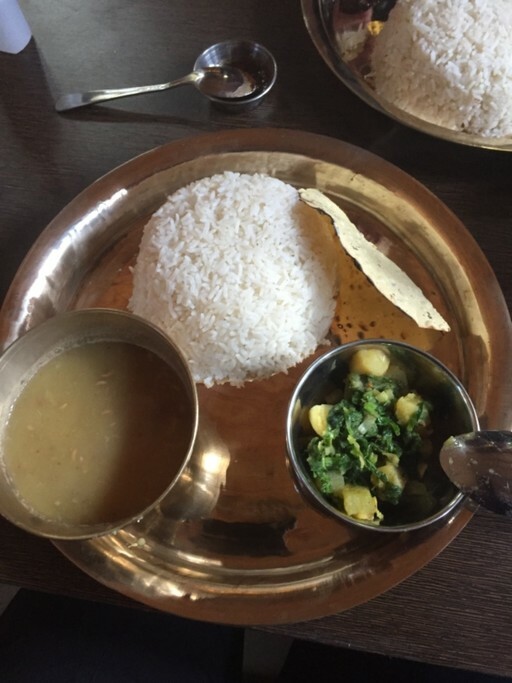 You'll arrive at Soti Khola, located in the Bhuri Gandaki Valley, in time for dinner. After breakfast in Soti Khola, you'll begin this epic trek up and down through various landscapes including forests, rice paddies, a cliff-face ridge, a rushing river, and several beautiful waterfalls. 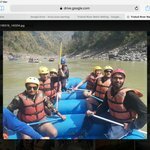 The journey begins by crossing a bridge, before you trek through a forest, then climb onto a ridge above the wild rapids of Budhi Gandaki River (which is joined from the Tum Khola River in the Tibetan highlands). 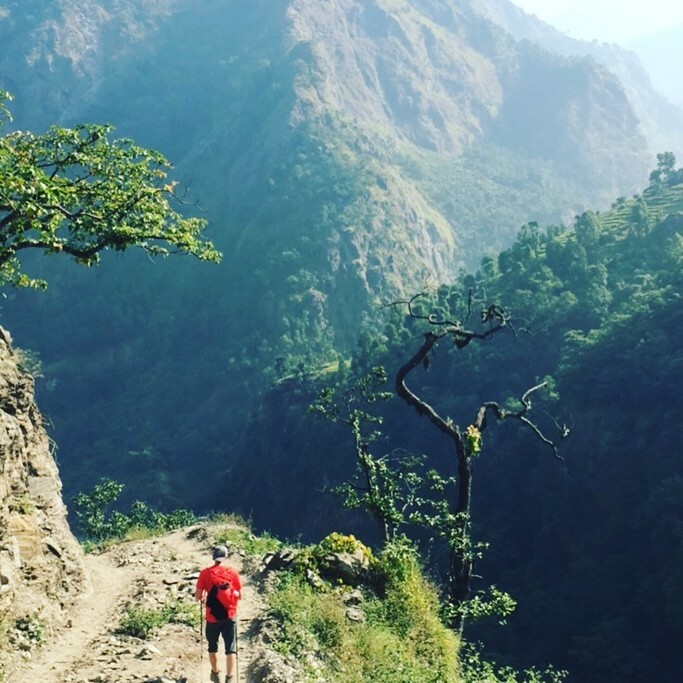 You'll then reach Khursane on a rocky trail, past two tropical waterfalls on a steep, rocky trail clinging to the side of a cliff. You'll eventually descend past a few ride paddies, then continue up and around to the picturesque Gurung village of Labubesi. From here, you'll further climb near a rocky outcrop where the valley opens up next to the river, which flows more peacefully here. Dropping down to the river shore, you'll walk along rounded stones before climbing over a side ridge. Head down again to the river and cross another suspension bridge to reach the village of Machha Khola. After breakfast in Machha Khola, you'll begin today's trek, which follows the gorge and continues up the river. The trail is narrow at first and gently heads up and down, eventually crossing the Tharo Khola to reach Khorlabesi. After more ascending and descending, you'll arrive at a small hot spring in Tatopani—a good place to take a break! From here, you'll climb over another ridge, then cross the Budhi Gandaki on a suspension bridge. You'll then climb up a staircase and head over a ridge to Dobhan. Upon crossing another suspension bridge over the Yaru Khola, you'll climb a stone staircase and then drop to the river and climb more stone stairs to Tharo Bharyang. Keep an eye out for neat Gurung villages in the jungle high above, as well as Langur monkeys, which roam the region. Crossing the west bank of the Budhi Gandaki, you'll climb over a ridge, trek along the river and then climb towards the village of Jagat. After breakfast in the village of Jagat, you'll make your way through various landscapes and dense sub-tropical forests, as well as small rivers and rustic villages to get to your final destination. Begin the trek by climbing over a rocky ridge to Salleri, and then descend to Sirdibas. The valley widens a bit as the trail continues to the Ghatta Khola river. You'll continue walking upstream to a long suspension bridge in Philim, a large Gurung village. From here, the trail turns north just above the lowest house in the village and stays on a fairly level trail as it crosses millet fields to Ekle Bhatti. The route now enters a steep, uninhabited gorge where you'll descend to the grassy slopes, and then cross the Budhi Gandaki river. Trek along the west bank for a while, then cross to the east bank before you return to the west side again. The trail widens through the valley and you'll pass through bamboo forests to the Deng Khola river. Upon crossing, you'll reach the tiny village of Deng. Even though there is another route, you will take the trail through Prok. This village has a beautiful vantage point of the snowcapped Siringi Himal. Take a break here and then continue to cross the Budi Gandaki several times today running into several gompas along the way. The trail then follows the river upstream through a dense forest and leads to a narrow gorge. Keep going until you notice the forest becomes less dense. 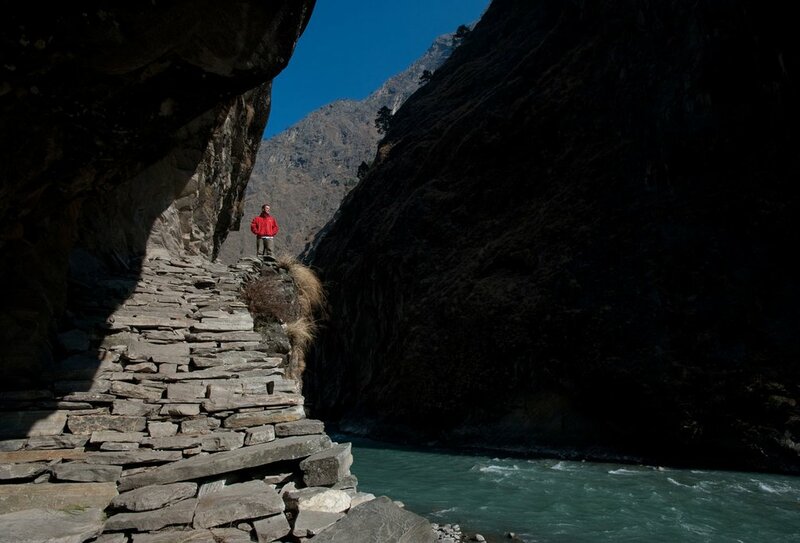 This rewarding part of the walk is a magnificent way to experience the Manaslu Conservation Area. 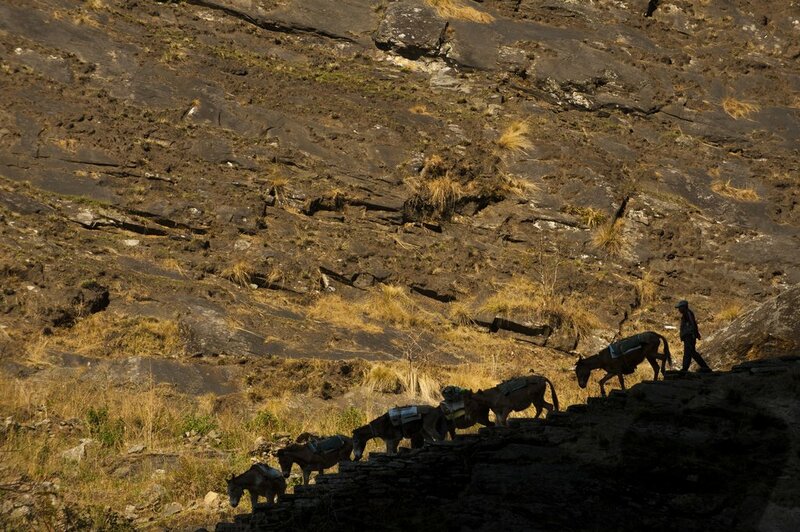 You'll eventually reach one last steep climb to get you to the village of Namrung. After breakfast in Namrung, you can walk around the village for a good viewpoint of Siring, Ganesh Himal, and also Mount Himal Chuli to the south. Once on the trail, you'll first climb steadily and pass through forests to reach Lihi, a fine village with many stupas and barley terraces. The trail then drops and crosses the side valley of Simnang Himal with Ganesh Himal always close by. Further along, you'll pass through the villages of Sho, Lho, and Shyala before reaching Sama Village. 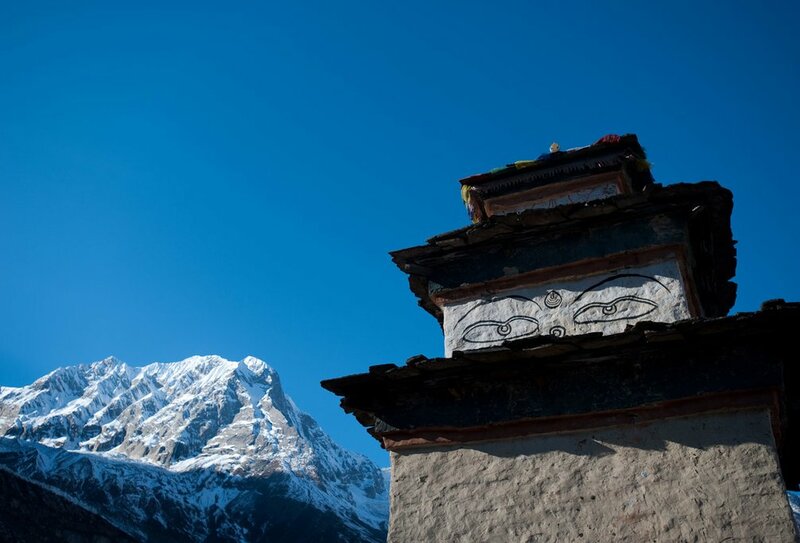 You can enjoy extraordinary views of Manaslu from Lho and also explore the famous Ribung Gompa. 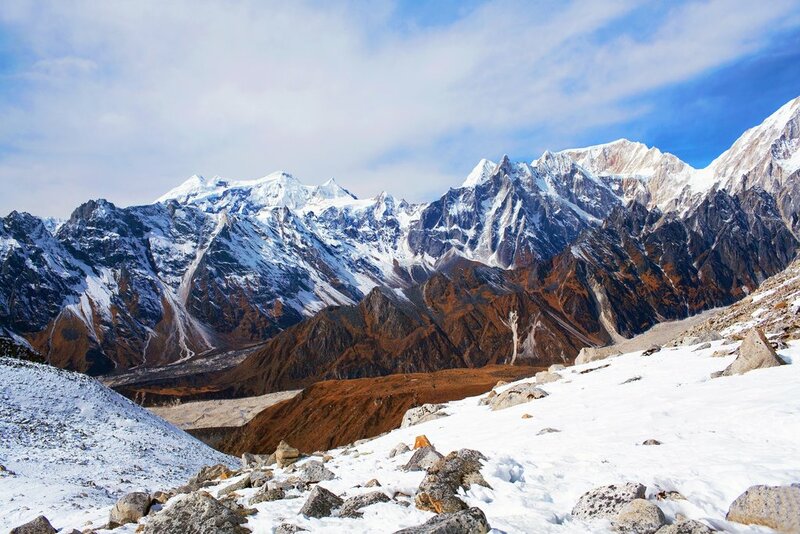 In Shyala village you'll be surrounded by high mountains like Himal Chuli and Peak 29 (Ngadi Chuli) to the left, Manaslu and large glaciers straight ahead. Other snowcapped peaks can be seen to the right, and at the far end stands Ganesh Himal. Today’s journey ends in Samagaon where you'll spend the night. Today is an acclimatization day, so sleep in and relax. Enjoy a refreshing breakfast and then spend the day at Samagaon getting some rest. 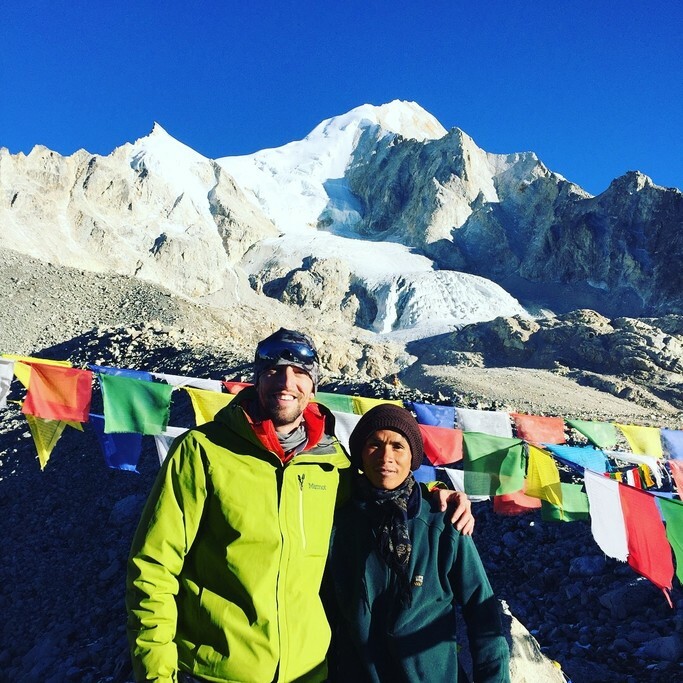 For those who want to explore, there's an optional day hike that explores some rich Sherpa culture. You can enjoy the sight of thousands of mani stones with Buddhist texts, as well as photos of Sherpa women clad in traditional clothes and ornaments. If you hike up to a little hill near the Sama village, you'll find an old gompa—Pungyen Gompa—a monastery with great views of the glacier. After breakfast in Samagaon, you'll descend to the Budhi Gandaki River and follow it to a bridge over a side stream. You'll pass several mani walls as the valley begins to widen. The mountain views along this route are amazing and get you close to the Tibetan border. This is an easy trek on a shelf above the river that passes juniper and birch forests in Kermo Kharka. Drop down and cross the Budhi Gandaki on a wooden bridge, and then climb steeply onto a promontory between two forks of the river. You'll come to a stone archway and continue walking until you find the village of Samdo. Take an easy trail up the valley directly behind of Samdo to one of the trade passes headed for Tibet. 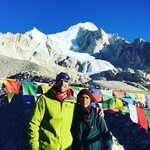 This route has excellent views of Manaslu along with other Himalayan ranges including Simrang, Hiunchuli, Ngadi, Larkye Peak, Cheo, and possibly Kang Guru behind the pass. En route to these viewpoints, you will pass many seasonal herding settlements called doksas and see some beautiful mountain birds like the Lophophorus (the national bird of Nepal), Lammergeyer, and Himalayan Griffin soaring above. A more challenging route is the trek to the Gya La (large pass) north of Samdo—a more frequently used trading route to Tibet. This is a longer full-day hike and not advised for those seeking a little rest. After breakfast in Samdo, you'll pass a seasonal Tibetan market called Larke Bazaar and descend to the Budi Gandaki River. Cross the wooden bridge and begin walking upward, crossing two streams while witnessing the Larkya Glacier. 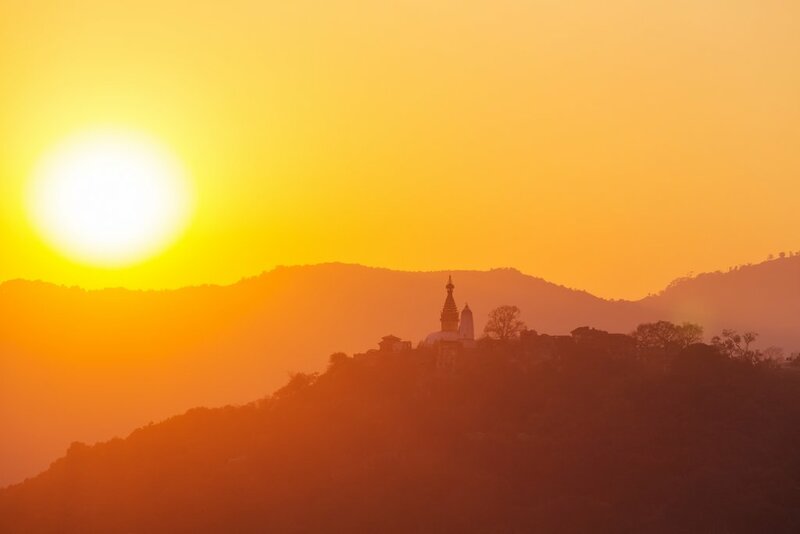 You'll head around the valley of the Salka Khola and climb up again to Dharamsala, also known as Larke Phedi. Along the route, you'll see many traditional monasteries. Today's shorter hike leaves time for acclimatization and relaxing in the afternoon. 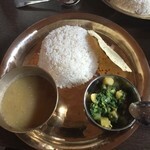 Today you'll set out on a longer hike so eat a hearty breakfast in Dharamsala. Thought it's a more challenging trail, you'll encounter a number of rustic villages, clear glacier lakes, beautiful valleys, and a wide range of flora and fauna, not to mention some notable snowcapped peaks. After a short climb, you'll reach a valley on the north side of the Larkya Glacier from where you can enjoy great views of Cho Danda and Larkya Peak. You'll walk across moraines of the glacier, making a gradual ascent, which becomes steeper in the last section of the pass. From here, there are outstanding views of Himlung Himal, Cheo Himal, and the massive Annapurna II. You'll finish with a rewarding walk into misty low pastures in the early evening with Mount Manaslu looming in the distance. After breakfast in Bimthang, head out to a nearby ridge where you can enjoy great views of Manaslu, Lamjung Himal, Himlung Himal, and Cheo Himal. Keep descending on the trail and cross a high pasture followed by a bridge over the Dudh Khola River. From here, walk through a rhododendron forest and follow a trail through a narrow valley until you reach the highest cultivated land of the valley at Karche. Pass through lush fields before making a steep climb over a ridge. The trail comes off the ridge in a big, sweeping arc to the river bank. A short distance beyond is the village of Gho where some trekkers choose to stay the night, but you'll continue walking until you get to Tilije. After breakfast in Tilije, you'll continue your descent starting with a climb over a small ridge where you can enjoy the stone paved trail. Then, cross the bridge over the Dudh Khola River and climb up through a stupa-shaped arch and past a mani wall before you reach the village of Thonje. Here, you'll go through a police checkpoint and continue to Dharapani. 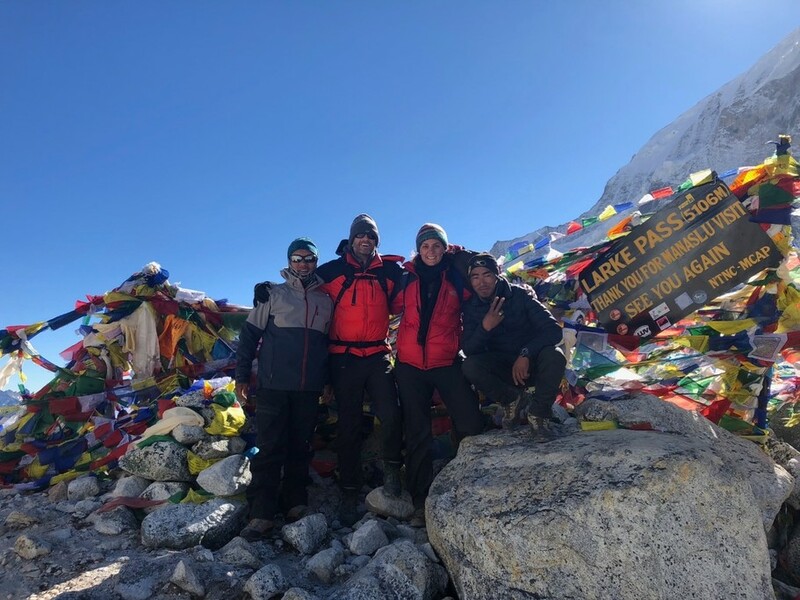 At this point, you have now exited the Manaslu Conservation Area and entered the Annapurna Conservation Area of the trek. 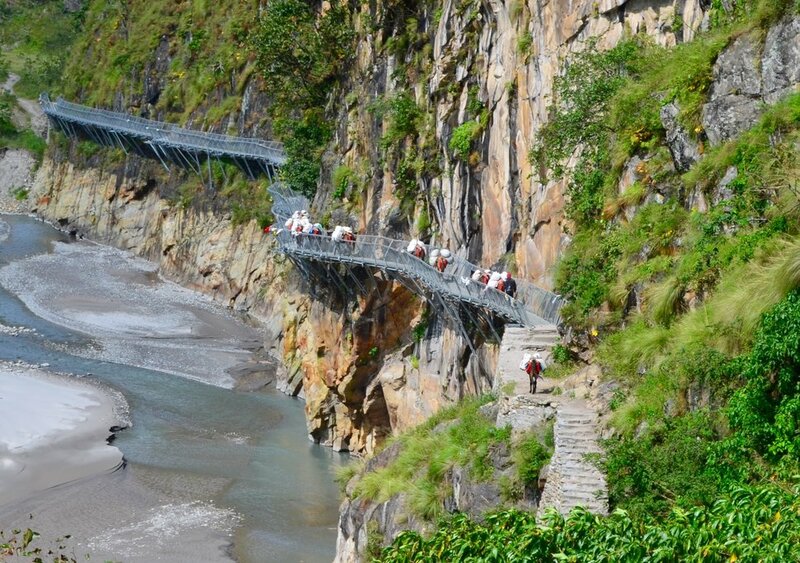 Further down, cross a bridge over the Marshyangdi Khola River. There will be some mani walls before reaching the village of Tal, situated at the foot of a large waterfall. This is a more commercialized area with lots of teahouses and trekkers. After breakfast in Tal, follow the trail down a sometimes steep trail to the village of Chyamje crossing the beautiful Marsyangdi Khola (once again) via a suspension bridge. The valley of the same name opens with its terrace fields while villages clung very high to the hillsides. The trail then descends further through picturesque rhododendron and pine forests to get to the village of Syange where you'll stay the night. This is your last night on the trail! Before dinner, make sure to check out Syange's magnificent waterfall. Wake up with breakfast in Syange and perhaps take one last walk around the village before you hit the road. 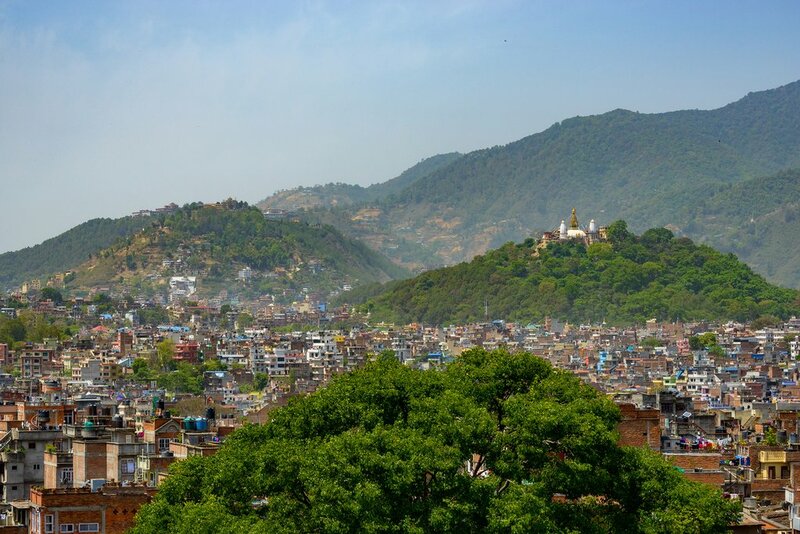 The drive from to Kathmandu via Besi Sahar offers an opportunity to enjoy both hill and mountain landscapes often coming into direct view with the banks of the Marsyangdi and Trishuli rivers. You'll also drive by some beautiful villages with farming terraces on both sides of the road. If you have the time, we highly recommend extending your trek for another week by adding the side trip to Tsum Valley to your itinerary. 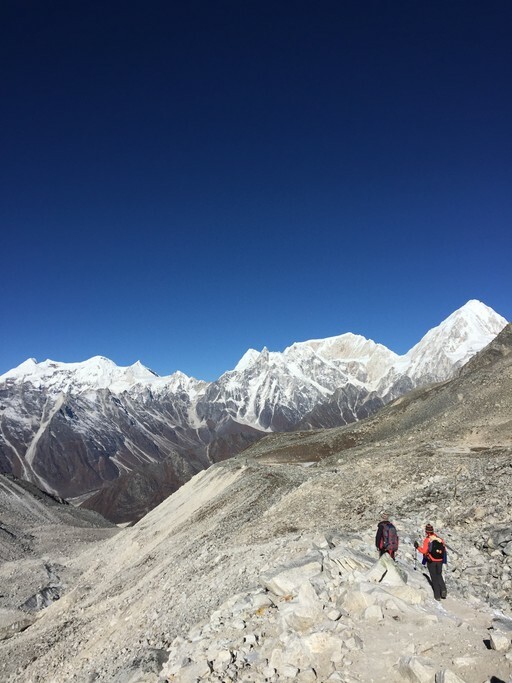 Tsum Valley is even more remote than the main Manaslu trail, and has amazing views, including the famous viewpoint above Mu Gompa pictured below. 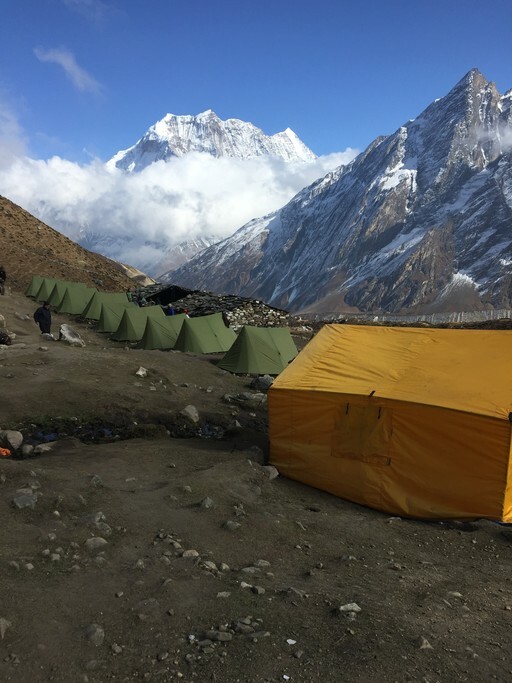 While most trekkers stay in teahouses, some choose to camp. 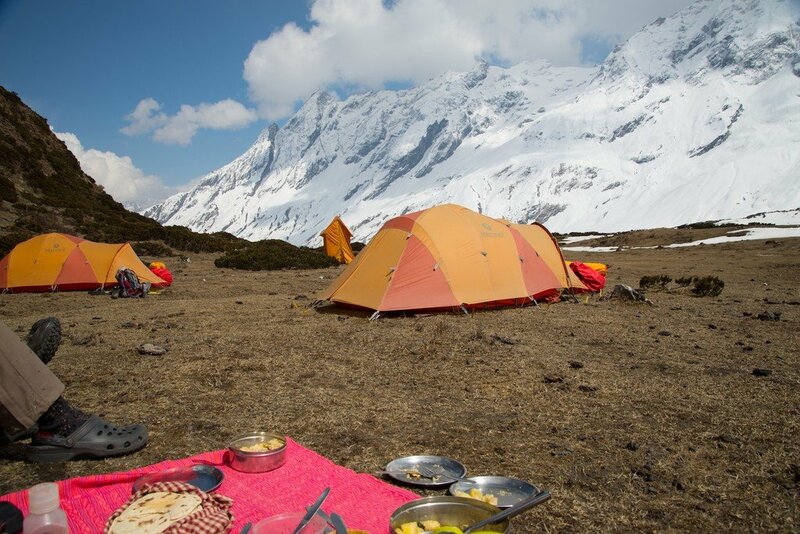 The advantages of camping include more flexibility to select camping spots that are further away from the villages where most trekkers congregate, and higher quality and more varied food since your crew will be carrying in supplies. Kimkim local specialist Kim Bannister runs an annual boutique Manaslu camping trek in her unique "Kamzang style". While pricier than the standard Manaslu teahouse trek, this option is great for trekkers seeking a "higher touch" experience. More info and dates & pricing can be found here. Kimkim local specialists are running small group fixed departures in 2018 and 2019. The treks include guide, porter, lodging, transport, and permits, but exclude food. See the full list of group departure dates. Do you have any questions about this trek or would you like to see how it can be customized to your needs? Our partners also run private treks just for you and your travel partners. To start organizing a private trek, get in touch here.